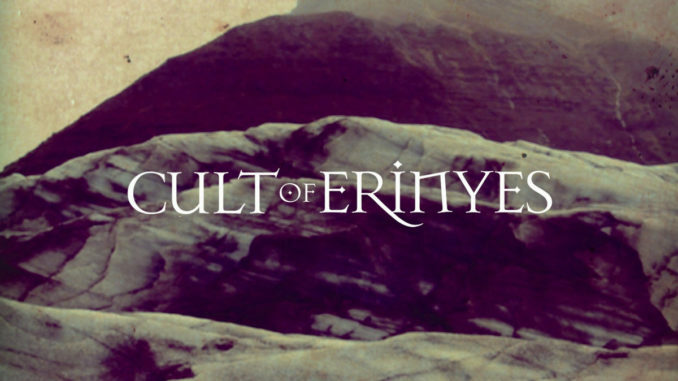 A tortured and gloomy atmosphere comes through the speakers at the outset of my listening experience to Cult of Erinyes. The music here is slightly raw, but carries forth a brisk pace at times that ever prevents it from becoming too much so. The hate filled aura of the band carries through in the mood of the songs. The dark and gloomy atmosphere that Cult of Erinyes tries to attain is convincing enough, but not overwhelming as seen from the final track “Last Light Fading”, for example. I didn’t find many avant-garde elements in the music, rather than in the emotional impact that is sometimes found which pushes A Place to Call my Unkown into somewhat left-field musical zones at times. This album is all about bleak intensity, however and at times the hateful feeling found will take over, but this isn’t always the case. I thought moments on here were more encompassing than others and the end result is a bit of a mixed bag, but often quite enjoyable. I was sometimes loosely reminded of the sound of very early Emperorwith this album, before they became overly progressive in nature. Even though I’m not the biggest lover of black metal that is has some raw elements, there was still a lot to enjoy here. The constant changes in tempo and mood kept things relatively gripping, though the music lagged slightly from time to time. Instrumentally, this is fairly solid, but not overwhelming. The vocal rasps are appropriate and the buzzing guitars hold up nicely in the mix, but nothing steals the show. I’m still somewhat confused as to what is overtly avant-garde with this album, but there certainly a reasonably large audience of black metal fans that A Place to Call my Unkown will appeal to.